This product requires the base game 100% Orange Juice. 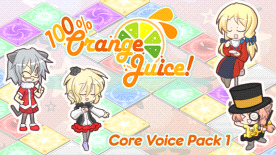 100% Orange Juice - Core Voice Pack 1 DLC contains new announcer and character voices for Poppo, Yuki, Hime and Fernet! New voices can be heard as announcers, and give the characters in question additional dialogue when they are in play. This pack automatically unlocks Poppo, Yuki, Hime and Fernet as playable characters if the user does not already own them. Requires base game to activate this DLC.